WHERE DO BLACK BEETLES NEST? 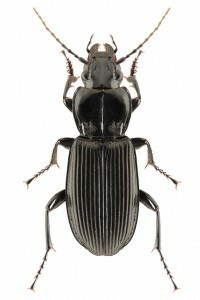 Black beetles are commonly found on the property of most any home. Generally considered to be a perimeter pest, black beetles can become invasive when left to populate and nest at their own free will. These beetles will range in size from less than 1/4 inch to almost 2 inches long. Generally dark brown to black, their bodies are tough like armor and they are quite resilient. You’ll notice a large sounding “crunch” when stepping on one. This ample body “shield” does a good job of protecting black beetles from traditional insecticides. 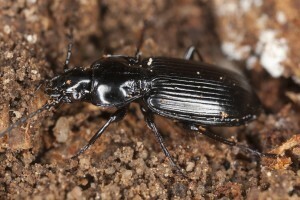 There are many species of black beetles that can live around the home and in most situations they are easy to tolerate. Problems arise, however, when homes are left untreated and unprotected at key entry points. 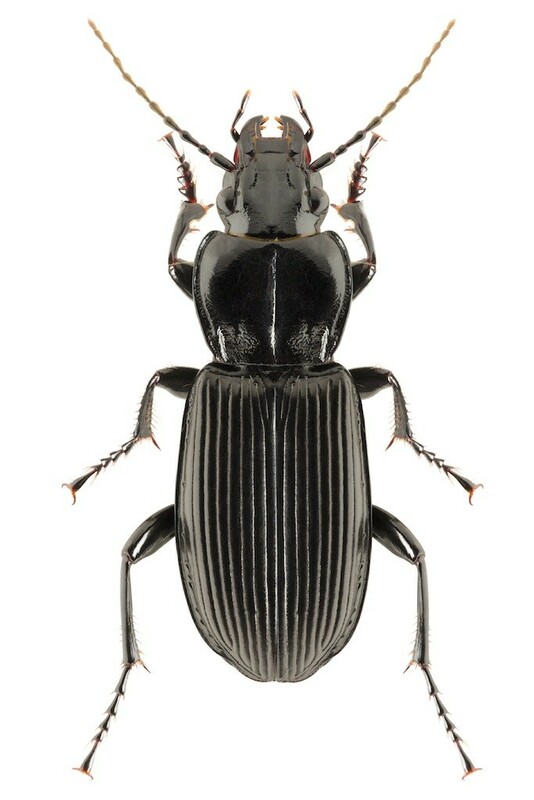 Black beetles are predatory and commonly forage for food in the dark of night. For this reason they’re many times able to go unnoticed until their numbers reach the thousands. Under the protection of darkness, they’ll emerge from rocks, mulch, wood chips and pine straw to go about their nightly business of foraging for food. As predatory insects go, black beetles are quite strong and can cover large distances in relatively little time given their short body size and lack of wings. Fortunately for them, nature has seemingly wired their senses to innately know where good food supplies will be readily available. As most people know, insects are attracted to light. Apparently, the word has gotten out and black beetles are now “in the know” as well. Bright lights, especially the blue and white neon lights commonly found at gas stations or roadside cafés, seem to be particularly attractive to black beetles. Homes which burn porch or deck lights will also many times attract insects which in turn attract black beetles. Your guess is right; they are most likely foraging to the light source your wife is having you keep on. And though turning it off may seem to make the beetles go away, all that’s really happening is a redirection of the population that’s undoubtedly living somewhere on your land. In other words, if you don’t treat their nests or the turf over which they must travel to forage, it’s highly likely they’ll start foraging inside your home at some point in the near future. As previously stated, black beetles love pine straw, wood chips, mulch and thatch under which they can create secure nests. These nests will protect them from the elements. But excessive rainfall, heat and cold will drive them to seek better shelter. In the fall, black beetles will forage from their nest sites to more accommodating locations. Residential homes and other structures make perfect winter getaways for hibernating black beetles. Because of their thick skin and upright body motion used when walking, ready-to-use sprays won’t prove effective when treating a beetle infestation. Black beetles will easily overcome such formulations. Combine this with the general “absorbant” nature of the ground and other ground cover around the home and it’s not likely any RTU formulation can provide the needed residual to have a significant impact. But what will work is a combination of two products. First apply BIFEN GRANULES to the turf and mulch areas surrounding the home. You’ll need to treat at least 10 feet out from the foundation and your goal is to create a band of treated soil. This band will act as a barrier through which foraging black beetles will no longer be able to navigate. Other pine straw and mulch areas on your property outside this “band” should be treated as well. Remember, black beetles forage over great distances so any nest sites on the property can lead to persistent home intrusions. Use 1.2 lbs of of granules per 1,000 sq/ft of turf and apply them once a month when problems are active; once every 3 months to insure they don’t com back. After applying the granules, spray over the top with BIFEN IT CONCENTRATE. This active works very well on black beetles. Add 1 oz per gallon of water and use this to spray over 1,000 sq/ft of ground and foundation. Treat monthly when problems are active; once every 2-3 months to insure they don’t return. Bifen can be used inside and outside the home and treatments will provide results immediately. But for better results, add SPREADER STICKER to the tank mix. Spreader Sticker enables the active ingredient (in this case the Bifen) to better “spread” over the target pest and treated surfaces. This will essentially “magnify” the spray and the net result is a faster acting spray which will achieve better results. 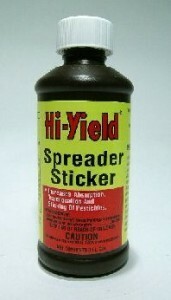 Add 1 oz of spreader sticker to every gallon of mixed Bifen. If black beetles have already invaded the home, you can spray the baseboards inside with the Bifen and Spreader Sticker tank mix. But for cracks and crevices, get either D-FORCE or the PT PHANTOM aerosol. D-Force has a slight odor but it’s quick acting, easy-to-use and will provide a fast knock down. Its ideal for most any insect and when you know where they’re nesting, a good choice. PT-Phantom is slow to kill. It generally takes 2-3 days to kill anything but this is by design. Phantom is undetectable by insects so beetles won’t notice where its been applied. They’ll readily walk over treated areas, pick up some of the chemical and then return to their nests where they’ll share with other beetles. In 2-3 days they’ll all die so if you’re unsure where the nests might be located, get the Phantom. So my flying black beetles are outside. I don’t see them during the day. However, as soon as I step outside at night and turn on the outside lights, they are everywhere crashing and thumping all around. They multiply quickly around the ground or on the screens. I live in Alabama and have not seen these before. Please is there a way to get rid of these before the get in my home? As explained in our article, you can get rid of this pest by treating the outside of the home. This will control their numbers which in turn will keep them getting inside. And the best products to use for their removal is the Bifen Granules and the Bifen XTS. So first you need to treat all the grass, mulch and flower beds around the yard by applying Bifen Granules at the rate of 1 bag for every 20,000 sq/ft of turf. Retreat every 30 days until they’re gone and then treat every 90 days to insure they don’t come back. Next, spray over the top of the granules with Bifen XTS using a Hose End Sprayer. Use 4 oz of concentrate for every 5,000 sq/ft of turf and treat weekly until you don’t see any. Bifen can be used on all plants, grass, etc. and won’t pose any kind of hazard to people or pets once applied and allowed to dry. Now once the beetles are gone, treat every 90 days (along with the granules) to insure they don’t come back. How should we control the Black Beetle in a warehouse environment where the outside does not have any soil near by? Black beetles will readily move inside homes and warehouses so in many cases the outside is irrelevant. And if you don’t have conditions conducive adjacent to the buildings exterior for them to live, I would surmise it would not be needed to treat outside anyway so your situation is common. That being said, you probably have them nesting somewhere inside the structure so if you treat areas where they’re active or being seen, you’ll probably knock them out easily. Now what should you spray? Go with the Bifen listed above. Its odorless and works great inside homes and warehouses. Bifen will readily handle black beetles and if you focus your applications along baseboards and other areas where you see them active, you should get control within 1-2 weeks. Now if the liquid is too messy for some areas, get the Phantom aerosol. Its odorless and with the included crack and crevice tip, you can apply it behind molding and into any little crack or void they might try to use. Phantom won’t kill them on contact (by design) but after 2-3 days, any that touch it will die. During the time following their first exposure, they’ll be transferring the active to other beetles so the net effect can be that one exposed member of a colony can end up killing many others hidden or unseen. Lastly, set out glue traps along the wall to monitor activity. This way you’ll know where you still have to treat, where a key source or nest might be located or maybe even an entry point otherwise missed. Thank you for this information!!!! I am so grateful to have stumbled upon your page. We have been fighting this ‘battle of the beetles’ for nearly 40 years now. You are a savior!! I believe we have a black beetle problem in our home. I’m killing these little beasts one by one before I go to bed. Only started about a week ago. Before that didn’t notice them. When using your products in the home, is it safe around pets? We have both cats and dogs. Also, we have a cedar would designed bedroom wall that I am finding they love to crawl on, can I spray the whole wall? My bed goes right up against it and they fall on me at night. Can’t handle it anymore. Second, the Phantom listed above is ideally suited for use on walls for spot treating. When applied properly, it only takes a little bit so there should be no residue or even “wetness” if you apply it right. But I’d focus more on where they’re coming from (the outside and probably the baseboard below the wall where they’re active). This way the treatment will be brought back to their nests and kill them all before they enter the rooms where you’re seeing them. I have never seen these bugs active inside my home before. The article mentioned about these bugs being easy to tolerate. They were at first, until after about a month when we started noticing them. Before, we would just step on them and clean up quick. But now, I know these bugs have populated. If we use your products, will having food exposed around (like on countertops and tables) be a problem? These pests have found their way around the house, even the bathroom and the bedrooms. Our home is a new build. We moved here 2 years ago. I thought I would enjoy a “bugless” environment, compared to our former home, which was built in 2000. I was wrong. I have high hopes your products will be the right treatment for us to use. P.S. We keep postponing having concrete/landscaping work done. Being a new build, our home did not cone with a backyard laid out. Could that have attracted these bugs more? Second, insects do not “decide” to live or invade structures anymore than they choose to infest a tree. But an unprotected structure (or untreated tree) is vulnerable to invading damaging insects. And once pests are established, the chances of them coming around more and more increase because of “smells” and “pheromones” they leave on the structure and land. These smells are used to tell others in the neighborhood that “hey, here’s a great place to live”. From there, problems will do nothing but get worse which is why you’re now seeing more than ever before. Long story short, any home or structure can be kept pest free if you treat using the products listed in our article. And this approach will work for all insects. Failure to treat means you are essentially “rolling the dice” and this is risky because at some point, every home will get insects active around it. But regardless of the homes age, it can be pest free. You just have to get into the habit of treating.